It appears there's not a lot of things that can ruin Andi Eigenmann's mood after she announced that she's expecting another child. And yes, that includes a fan who suggested that it is a shame that the actress, who is pregnant again, has yet to marry. There was a sense of calm in her reply where she said that she was not "angry" at the fan who called her "sayang" -- just disappointed. "People having different beliefs as I do does not anger me. Otherwise I wouldn't have taken the time to let you know how your message made me feel," she wrote. "But we should learn to accept that everyone is different and we have no right to shove our beliefs on others. "I called you out because it's such a shame when women bring other women down. Not because I am angry," she added. It was in reply to a fan who told her: "Sana Ands pakasal ka muna sayang." She also downplayed other suggestions about the possible reaction of her mother, Jaclyn Jose, saying: "She is very excited." 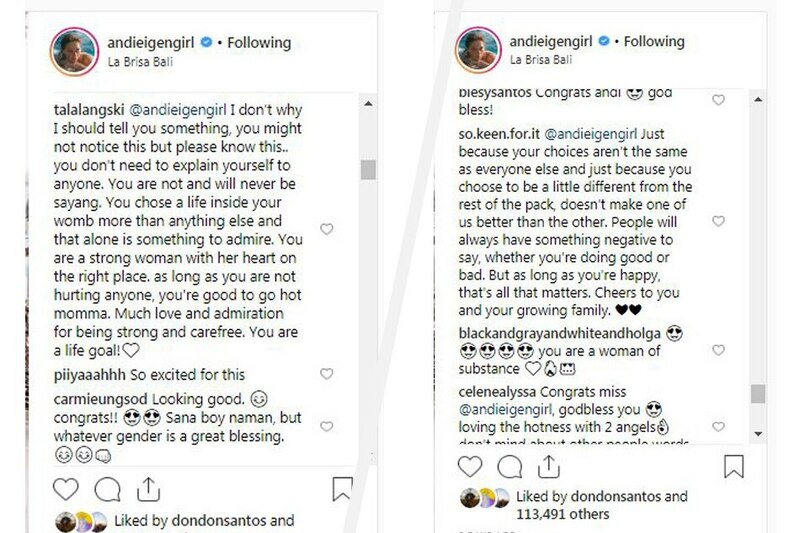 The way Eigenmann addressed these criticisms drew praise from her supporters, who told her that she didn't really need to explain her decisions to other people as long as she's not hurting anyone. 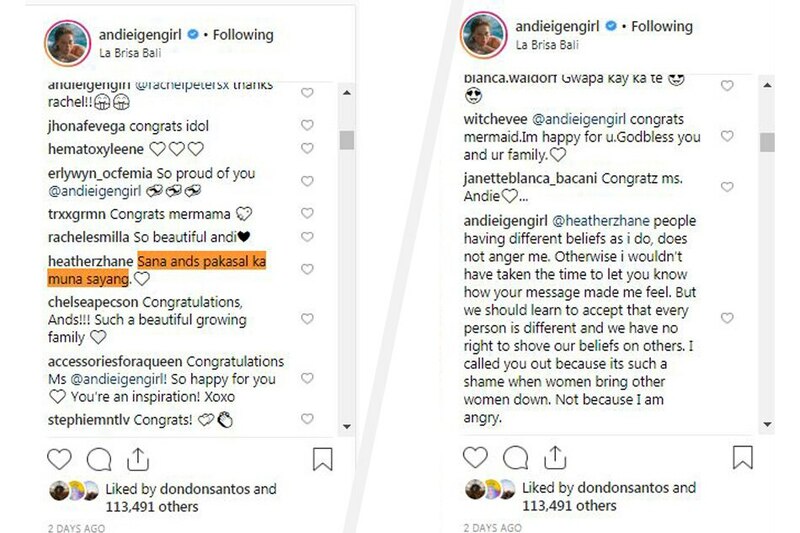 A screenshot of the praise Andi Eigenmann drew after opening up about her second pregnancy. It was last Friday when Eigenmann, who is in a relationship with surfing champion Philmar Alipayo, revealed that she's pregnant. This would be her second child after Ellie, whom she gave birth to back in November 2011.